Skynamo (formerly Honeybee) is a cloud-based customer relationship management (CRM) and field sales solution designed for manufacturers, wholesalers and distributors who use field-based reps to regularly visit, service, and sell products to customers. Native apps for Android and iOS allow users to collect data, manage contacts, load images, place orders, create tasks, and track sales on-the-go. Skynamo allows users to access customer, stock, and pricing information from anywhere, through integration with a range of accounting and enterprise resource planning (ERP) systems. With the integrated product catalog, sales reps can show customers exactly what is on offer, and place orders or quote requests from within the mobile app. Custom forms can be used to collect data in the field, removing the need for manual data entry in the office and reducing the chance for administrative errors. With Skynamo, users can track the GPS locations of sales reps in real time, and daily call reports are generated to display locations and routes travelled. Travel claims, distances travelled, and odometer readings can be logged for tax records. Time spent driving and in visits can also be tracked. Customers can be added to the Skynamo CRM, with customizable data fields and a live timeline which displays all transactions, activities, and invoices. Excellent, rewarding, innovative, well structured. After sales support is world class, ease and simplicity of functionality of the system, technology aligned to desired sales rep behaviours, simple and easy to maintain database structure, added functions for additional revenue opportunities. Openness of the Skynamo team to consistently find ways to make the system even more user friendly and dynamic. Some of the basic reporting, but this was largely an internal issue. When the CRM reporting is opened up, then this product will compete on a global scale and add substantially more value to businesses. We are able to capture live information from the field in an easy to read and understand daily report which can be sent to multiple users.Easy to use with a simple interface and for those that still battle there is constant reinforcement training offered. Easy to use with a simple interface and for those that still battle there is constant reinforcement training offered. The contact section could have more options and the ability to accept more contacts per customer. The Insights interface could be a little more user friendly by remembering customer preferences and implementing them on the next log in. The tracking option could be brought more to the forefront with a dedicated report for easier use. Can't believe I ever worked without this app. The ease of communicating and tracking my sales reps during the day. The customer information I have available.The removal of all paperwork and and ease of tracking customer spend. The tracking and communicating with sales reps during the day. The removal of all paperwork and and ease of tracking customer spend. The tracking and communicating with sales reps during the day. The only comment I can make is that due to our constant communication through Skynamo the battery life on the tablets don't last. I have been using this software for more than 2 years and I can truely say that there is not "cons". A fantastic tool that allows me to help my sales team boost their sales. It literally captures everything that my sales team do, and helps me feed them the info that they need from me. Nothing wrong with the software, but it can be battery intensive as well as cpu if the sales person is capturing a large order. Team: $39/user/month (billed annually) or $46/user/month (billed monthly). Business: $68/user/month (billed annually) or $83/user/month (billed monthly). Enterprise: contact Skynamo for pricing. GPS tracking allows users to view sales rep locations and track time spent traveling and on customer visits. Customers can be created and edited in the CRM, with support for custom fields, locations, and a live timeline of transactions, activities, and invoices. Customizable forms allow users to collect any data they require while in the field and reduce data entry and administrative errors. Orders, quotes, and credit requests can be created, with support for multiple price lists, minimum and warning prices, buy groups, contract prices, and more. Managers can view activity updates in real time, track key performance indicators (KPIs) through the built-in dashboard, judge sales rep performance, identify problem areas, and generate sales projections. Below are some frequently asked questions for Skynamo. Q. 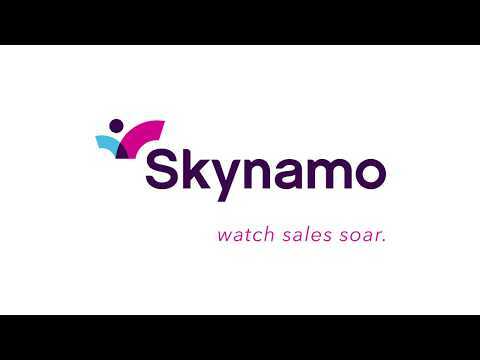 What type of pricing plans does Skynamo offer? Q. Who are the typical users of Skynamo? Q. What languages does Skynamo support? Q. Does Skynamo support mobile devices? Q. Does Skynamo offer an API? No, Skynamo does not have an API available. Q. What other apps does Skynamo integrate with? Q. What level of support does Skynamo offer?